Among the many reasons to choose a Central Florida retirement community like Lake Ashton is the number of amenities on hand to fill your days. That includes indoor and outdoor swimming pools that give you all of the enjoyment and exercise of a pool without the time-consuming and strenuous maintenance. With a climate that allows for swimming year round, as well as heated pools, it’s no surprise that many Lake Ashton retirees turn to pool exercises to maintain their health. Pool exercises are ideal for just about anyone, because they’re typically easier on the joints but still provide an excellent workout for cardio and strength. Besides swimming laps, the following are simple exercises that work out different parts of your body and they require no equipment. To strengthen your arms, head to a section of the pool where the water comes up around your neck. If you are concerned about balance, stay within arms reach of the pool edge. Plant your feet with one slightly ahead of the other to give yourself a solid foundation and then raise your arms out to the side but still below water. With your palms down and your arms straight, begin making circular motions forward with your arms, remaining underwater, for 10-15 seconds. Then reverse direction and do another set for 10-15 seconds. To work your abdominals and obliques, try the wall chair exercise. Go to an edge of the pool where the water is chest deep. With your back against the wall of the pool, stretch your arms on top of the edge to support your weight. Then simply pull your legs together and while bending your knees, use your abdominal muscles to pull your legs toward your chest as if you’re sitting on a chair. Try to do 10-15 repetitions. To tighten up your waistline, you can add another set of reps in which you perform the same motion, but then twist your body and legs to the right and left, alternating each side. Finally, to keep your legs strong and toned, move to the side of the pool where the water is around waist deep. You should be parallel with the side of the pool, with one hand holding the edge to maintain your balance. Then swing your outside leg forward and hold it for five seconds, keeping your leg straight. Then swing your leg behind you and hold for another five seconds. Repeat this sequence 10-15 times and then turn and do the other leg. As you perform each exercise, you’ll find that multiple muscle groups are being exercised as you also work to keep your balance and perform the motions. As we get older, it is just as important to work on balance as strength, and pool exercises help with both. 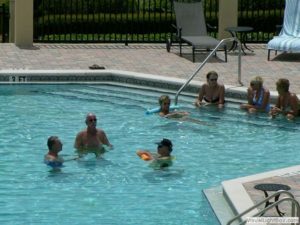 Take advantage of the pool aerobic classes available at the Lake Ashton Central Florida retirement community, but also work in a few exercises of your own any time you go to the pool. They only take a few minutes and you can even chat with friends as you do them. Sign up right here for a free email information packet about beautiful Lake Ashton or visit CONTACT US now!